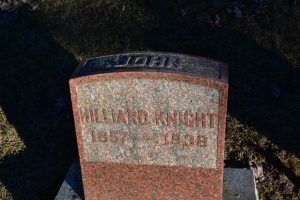 Dr. John Hilliard Knight was born in Chatham Township near Wallaceburg, on August 2, 1857. 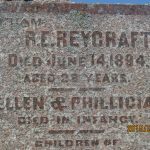 He was one of 8 children, born to Silas Watson Knight and the former Abigail Burnham. His parents farmed on the Chanel Ecarte, about 3 miles from Wallaceburg. A brother and a sister died young. Dr. Knight grew up with 5 brothers; Milton, Charles, Alonzo, Silas and A.G.
After completing high school, Dr. Knight taught school and saved money to further his education. Dr. Knight studied medicine at Queen’s University in Kingston, Ontario and graduated M.D. in 1880. Dr. Knight started his practice in Wallaceburg in 1885. He was a member of the A.F. & A.M. and he was the Medical Officer of Health for the Town of Wallaceburg. Dr. Knight married Effie Jane “Jenny” Fraser in Wallaceburg on the 28th of July, 1886. Mrs. Knight was born on the 30th of September, 1861 in Port Bruce (Elgin County), Ontario. She was the 7th of 9 children born to Charles Fraser and the former Jane Campbell. Although she was born in Port Bruce, she was raised in Wallaceburg. Her father was a tax collector and a land surveyor. Her siblings were; Charles, Henrietta, Caroline, John, Alexander, William, Thomas and Minnie. Dr. and Mrs. Knight had 3 children, all born in Wallaceburg; Abigail H. was born on the 8th of January 1888, Charles Fraser was born on the 4th of June, 1890 and Frederick Rice was born on the 9th of December, 1893. 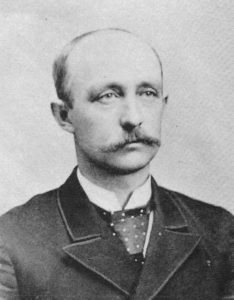 Dr. Knight advertised his medical practice in Wallaceburg in the 1886 Elgin, Kent, Essex and Lambton County Business Directory and in the 1893 Ontario Business Directory and Gazetteer. In 1901 the family was living in Ameliasburg, Prince Edward County, Ontario. In 1916, the Knight Family resided at 353 Ominica Street West in Moose Jaw, Saskatchewan. According to the 1921 census, the family resided at 330 Stadicona Street W. in Moose Jaw. Dr. Knight died on the 7th of August of 1938 in Moose Jaw, Saskatchewan. Mrs. Knight died on the 29th of August, 1938. They are buried at Riverview Cemetery in Wallaceburg. 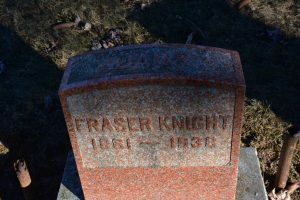 *His son Charles “Fraser” Knight graduate from The University of Toronto Faculty of Medicine in 1913. He was known to be practicing medicine in Dartford, Kent, England in 1938. His son Frederick Rice Knight served with the Canadian Armed Services in WWI and he served with the United States Army in WWII.